Chocolate: A Food Without Borders Now living in Spain, editor Alejandra Garcia has learned that chocolate speaks an international language — and it's always in season. 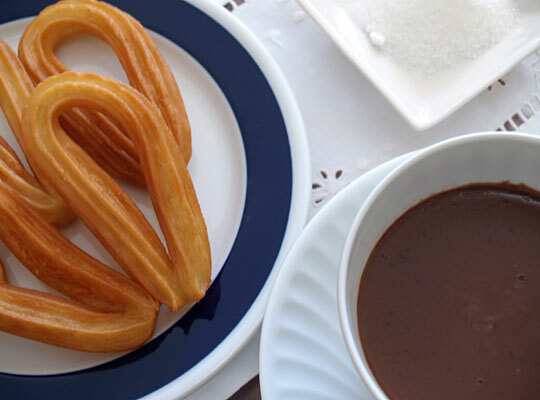 Eating chocolate "the Spanish way" means anything from a chocolate muffin for breakfast, to a chocolate drink before bed — or chocolate churros anytime. Get recipes for Churros Con Chocolate, Cream Of Chocolate, Chocolate And Pistachio Magdalenas, and White Chocolate Truffles. Born in Lima, Peru, and raised in both Kentucky and North Carolina, Alejandra Garcia has mastered the arts of ceviche, sweet tea and saying "y'all." She currently lives in Marbella, Spain, and works as an editor for the Spanish lifestyle magazine Absolute Marbella. 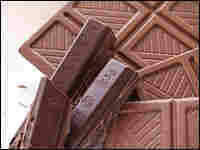 The Mayans saw chocolate as a divine gift with healing powers and positive health effects. The cacao tree was even an integral part of their creation story. For me, this is enough reason to try to taste every type of chocolate under the sun. Here are a few tips for having your own chocolate-tasting party. The Chocolate. Your tasting should have no more than four or five chocolate samplings, or it will become difficult for your palate to differentiate. Keep the pieces small and at room temperature. The Time. Some experts say that the best time for a tasting is in the morning, when your palate is free from lingering tastes. Whenever you do it, keep a glass of water nearby to cleanse your mouth between samplings. The Method. There are different ways to set up a sampling. You can taste the same percentage chocolate from different parts of the world, or sample a range of chocolates with different percentages of cocoa. You can also try a selection of only bittersweet chocolates or only white chocolates. Note the difference in aroma and texture in the different brands. Chocolate speaks an international language. There is no concern about accents or incorrectly structured sentences. Whether in Tokyo or Madrid, everyone understands chocolate's many culinary dialects. I grew up in the southern United States thinking that chocolate was a treat associated exclusively with dessert. Now living in Spain, I haven't found it hard to adjust — especially to one specific traditional practice: eating chocolate the Spanish way. Drinking chocolate, white chocolate truffles, hazelnut-chocolate muffins — the Spanish love it all. Small children, for example, snack on chocolate sandwiches, made with bread in the shape of a hot dog bun filled with chocolate paste. Spain has taught me to eat chocolate for breakfast. 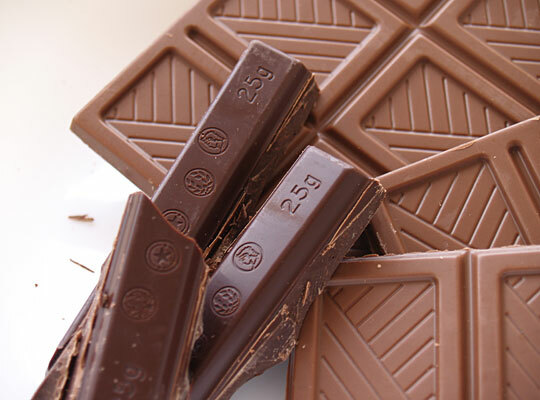 The Spanish go out at night until the wee hours of the morning, and then have a cup of chocolate for breakfast on their way home, before going to sleep. Small cafeterias stay open throughout the night to serve straggling club-goers and early-rising tourists chocolate con churros, a breakfast or afternoon snack that involves dipping fried dough — churros — into a cup of warm, melted drinking chocolate. 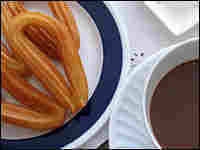 The churros are made of flour, water and butter and can be shaped into any form — short strips or circles, for example. Everywhere from Barcelona to Marbella, I've been to churrerias (shops that only serve churros con chocolate) where paper plates are piled with coils of churros sprinkled with sugar. Because nearly all Spanish homes are equipped with small deep fryers, it's not unusual to have homemade churros for breakfast on a Sunday morning. Perhaps it's the experimental spirit of the Spanish in the kitchen that fuses chocolate with nearly anything that's edible. One of the country's most celebrated chefs, Ferran Adria, has been called a "molecular gastronomist" for using liquid nitrogen and calcium chloride in his cooking. He created a chocolate beef stock that caused quite a stir, but one of his most adored and simple recipes calls for toasted bread dabbed with bittersweet chocolate and sprinkled with sea salt and olive oil. It sounds odd, but why not? Valor, one of the longest-running and most popular brands of chocolate in Spain, has integrated into its box of bonbons unusual flavors that reflect the most important ingredients of Spanish cooking: black chocolate with olive oil and tomato; vinegar and milk chocolate; or whiskey and champagne with hazelnut paste and white chocolate. For me, chocolate is best in its purest and simplest forms. A single bar of chocolate with a high cocoa (or cacao) content makes perfect company while I'm working away at the computer, or when I need a late-night nibble. Over the years, I've learned to pay more attention to the label — and the taste — of the bars that I buy for cooking, since every brand and type will have a different effect on the final dish. Often, packages are labeled with a certain percentage of cocoa, which refers to the amount of cocoa bean solids in the chocolate. The rest is sugar and milk. The higher the percentage of cocoa, the more bitter the chocolate will taste. The percentage of cocoa isn't all that affects the flavor, however. Like wine, chocolates can vary greatly in taste depending on where the cocoa bean is from, its combination with other beans and how long it was roasted. One other attractive quality of chocolate is that it doesn't have a "peak season." It's always chocolate season. I adapted this recipe from a chocolate shop in Madrid. If you don't have a pastry piping bag for squeezing the churro batter into the hot oil, just cut the tip off a small heavy-duty plastic bag, and it will work just as well. I recommend keeping a glass of water nearby, as this is a heavy snack. Heat the oil in a deep-frying pan to 360 degrees. To make the churro dough, heat the water, margarine and salt to a boil in a 3-quart saucepan. Add the flour and stir vigorously over low heat until the mixture forms a ball, about 1 minute, and remove from heat. Beat eggs until smooth and add to the saucepan while stirring the mixture. Spoon the mixture into a piping bag or plastic bag. Squeeze 4-inch strips of dough into the hot oil. Fry three or four strips at a time until golden brown, turning once, about 2 minutes on each side. Drain on paper towels. For an added kick, roll the finished churros in the sugar. Serve hot. To prepare the hot chocolate for dipping, place the chocolate and half the milk in a saucepan over very low heat and cook, stirring, until the chocolate has melted. Dissolve the cornstarch in the remaining milk and whisk into the chocolate with the sugar. 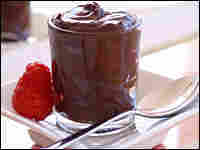 Cook on low heat, whisking constantly until the chocolate thickens, about 5 minutes. Remove and whisk until smooth. Pour chocolate into cups and serve with churros. Because of the sheer purity and richness of the chocolate, I keep the serving portions quite small. Even for a chocolate lover like me, a large serving is just too much to handle. Cut the chocolate into small pieces and set aside in large bowl. Boil the milk and pour over chocolate pieces. Add the melted butter slowly and fold delicately until the mixture becomes smooth and uniform. 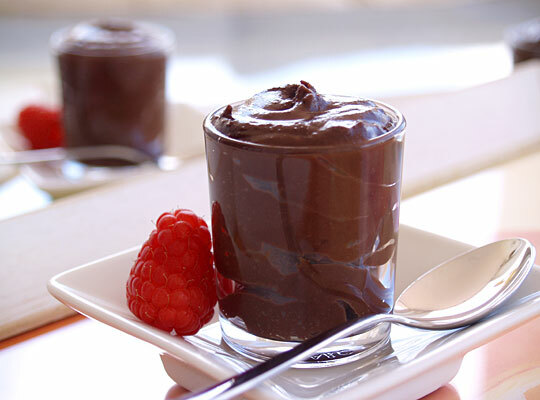 Pour the mixture into shot-size glasses or dessert cups and place in refrigerator for 2 hours before serving. Decorate with red berries or mint leaves. 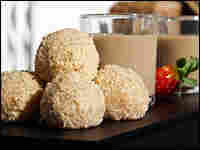 Muffins, or magdalenas, are a common breakfast food in Spain. 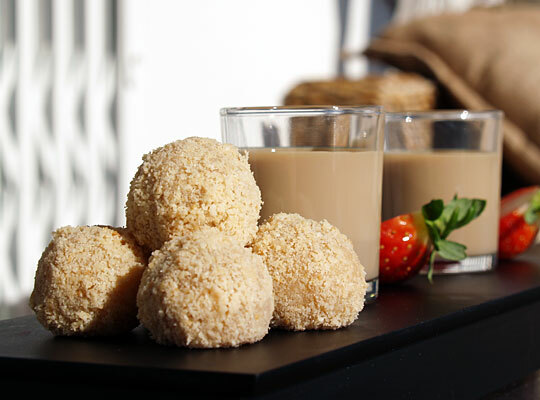 Before going to bed, many Spaniards dip small pieces of magdalenas into a warm glass of milk. This is a more chocolaty, vamped-up version of the typical vanilla magdalena. Preheat the oven to 300 degrees. Grease a muffin pan, unless it is nonstick. Chop the pistachios roughly into medium chunks. Break both chocolates into small pieces and place in a bowl with the butter. Microwave until the mixture is nearly melted, but remove while there are some chocolate pieces still whole. Stir by hand until the mixture is uniform. Set aside. Add the sugar to the eggs in a separate bowl and fluff until the volume is double in size. 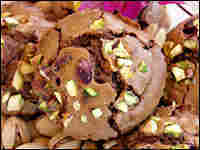 To the egg mixture, add the flour, baking powder, the chocolate mixture and half of the pistachios. Fold delicately until the batter is uniform. 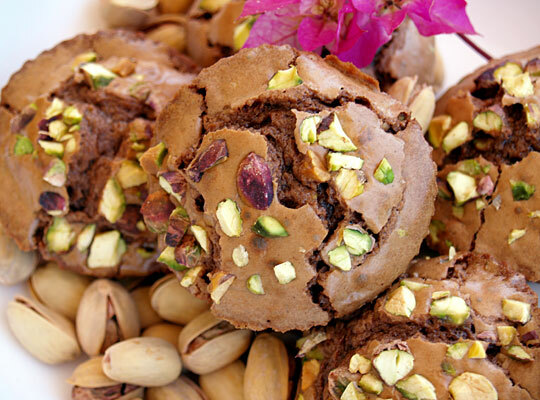 Pour the mixture into the muffin pan, filling the cups halfway, and sprinkle with the remaining pistachios. Bake for 25 minutes. White chocolate is a blend of cocoa butter, milk solids, sugar and vanilla, is ivory colored, and is quite rich and creamy. But it can't actually be classified as chocolate because it doesn't include cocoa liquor, the thick liquid produced when fermented cocoa beans are shelled and ground — the key ingredient in all chocolate. Don't worry if these don't look like the average truffle. The outside shell won't be hard, but the taste will have you coming back for more. They're nice as an after-dinner mini dessert. Line a cookie sheet with parchment paper. Place the cream in a heat-proof bowl and set over a pan of simmering water. Cook until heated through. Lower the heat. Using a whisk, slowly stir the white chocolate into the warm cream until completely melted. Whisk in the liqueur and vanilla extract. Take off stove. Cover and chill for 1 hour, or until pliable but firm enough to scoop. Using two teaspoons, make dollops of the chocolate mixture and form them into tiny balls with your hands. Place balls on the baking sheet lined with parchment paper. Refrigerate for about 15 minutes or until the tiny balls are cool. Chop the hazelnuts or pass them quickly through a blender or food processor and roll half of the chocolate balls in the chopped nuts. Melt the bittersweet chocolate and drizzle over the other half. Chill until ready to serve.